Knights, these are very random things that are helpful to know. From football games to campus concerts, college life can be expensive. The University does not want anyone to miss out on the ND experience because of financial circumstances. If you qualify, the Rector Fund could help cover the cost of events and activities sponsored by school organizations. For details, go to the Student Affairs Website. Throughout the year, Facebook class pages are inundated by students looking for their missing property, from jackets to iPhones. It may be a good idea to purchase a student property insurance that covers items in the case of theft or damage. It is not too early to start booking your flights from/to Notre Dame. Many students choose to go home during the October, March breaks as well as during Thanksgiving and Easter. Dorms are closed during the Christmas break (Late December/Early January). If you want cheap flight tickets, it is never too early to start looking. Don’t wait until the week before! If you are flying out of Chicago Midway or O’Hare, CoachUSA buses run in two-hour intervals everyday. Typically, you do not need to purchase bus tickets too far in advance. If you choose to fly out of South Bend, you will need to book a cab. What if I stay for Breaks? Many students also stay on campus during breaks. Usually, one of the two dining halls remain open. Breaks are also a good time to bond with other students staying for break. Flexpoints: They are part of your meal plan. You can use the points to buy food (Subway, Starbucks, Smash Burger*, the Huddle Market) in the LaFortune Student Center. You receive $410 per semester, and yes, the points carry over from Fall to Spring. However, they expire at the end of the school year. Domer Dollars: They are like cash. You deposit money by using a credit card, and they can be used for things like laundry, vending machines. They can also be used at a CVS store in Mishawaka, and at Five Guys and Chipotle on Eddy Street Commons. They never expire. Printing Credit: You are given $90 per year for printing. You will probably never run out of it. Just like at home, all major U.S. mail carriers service our dorms. Unlike at home, USPS (the post office) does not deliver directly to each address. Rather, two students within Keenan are hired to deliver mail to the mailbox in the basement. This unfortunately results in one or two business days delay of mail delivery than would be normal. If you send a package overnight via USPS, it will most likely not be delivered on time. UPS and FedEx do deliver to your room, and they are seldom late on schedule. If you want to send something out of Notre Dame, you can visit the Post Office, located northeast of the dining hall (about 3-minute walk from Keenan), or you can use the FedEx Office located in the basement of LaFortune. It’s the end of the school year, and you have a roomful of stuff. Now what? Fortunately, the school provides a cheap solution. At the end of the year (usually two weeks before the last day of finals), a trailer comes to Keenan for people to store their various belongings. The prices are relatively nominal (last year’s prices: $25 for futon, $15 for fridge, $15 for TV, $10 for chair, $10 for bike, $10 for a box, etc.). Alternatively, you can hire a personal storage, but it tends to run around $300 for the whole summer. What about my student ID card? Your student ID card is very important. It is not only your identification but also your meal plan card, library card, building access card (including Keenan) and to rec sports, charge card for the bookstore (billed to your student account), and the internal debit card (a.k.a. domer dollars). Once you arrive on campus, you will need to get your ID picture taken. The Card Office is in the South Dining Hall (SDH) basement. There is a special location and special hours during Frosh O. Enter through Reckers, hours are: 8:00–5:00 Wed through Fri and 8:00–11:00 Sat. A government-issued photo ID, e.g. driver’s license or passport is required. Meal service is included as part of your housing contract. On campus students are enrolled in the “Flex 14” meal plan. This plan provides 14 meals each week (Saturday morning through Friday evening) plus 410 flex points/semester. A flex point is worth one dollar at any food service establishment, including the dining hall as payment for a guest or for meals beyond 14 in a given week. Flex points are not valid at concession stands or vending machines. LaFortune Student Center has numerous food options such as Burger King, Starbucks, Subway, and the Huddle Mart (a small convenience store). Reckers, located behind the South Dining Hall, is a 24-hour restaurant. Flex points expire at the end of the academic year–use them or lose them. There is a 21-meal plan available for students who prefer three meals a day, seven days a week. This plan does not include any flex points. In the first two weeks, if you find yourself eating more than 14 meals per week in the dining halls, you may want to change to the 21-meal plan. New in 2016, the Green Plan is a $250 upgrade per semester and provides $315 in Flex Points (instead of $410) AND $315 in Domer Dollars. Check out this webpage for more information. Different from flex points, Domer dollars can be used any place flex points can be used. They can also be used in most vending machines, laundry machines, etc. Domer dollars can be more convenient than carrying cash. It operates as a debit card which you fund. You can add dollars to your account at any time. Unused Domer dollars never expire and they can be refunded. Statements are e-mailed to students on a monthly basis. In places where both Flex Points and Domer Dollars are accepted, Flex Points, if available, will be used before Domer Dollars. How do I handle a late night snack attack? The best pizza in the land is in Zaland, Keenan’s own food sales. Zaland is located in the basement of Keenan, is managed and run by members of Keenan and sells drinks, hamburgers, pizza slices or whole pies and other delectable items. Other options are available at Recker’s and LaFortune. Of course there is always delivery from many pizza places and other restaurants. Where on campus can I go to pray and worship? As a Catholic university, Notre Dame has many places for worship. Each dorm has its own chapel (Keenan shares its with Stanford Hall) plus other classroom and office buildings also have chapels. The Basilica of the Sacred Heart of Jesus is centrally located next to the Main Building. There are multiple opportunities for daily and Sunday Masses. The Sacrament of Reconciliation is also available on a daily basis. The Grotto is a special place for students and alumni who often spend quiet time there prior to an important exam. Notre Dame is committed to the spiritual growth and welfare of all its students. All students and visitors are invited to participate to the extent possible at all worship services on campus. Also, efforts are made to assist non-Catholics with finding a comfortable place to worship. There are some services on campus. Area synagogues, churches, and mosques welcome students, some even provide transportation. For additional information, check out www.nd.edu/~ministry. While South Bend has many banks, only one is available on the campus (1st Source Bank). Others are NOT within walking distance. The 1st Source Bank has an office inside the La Fortune Student Center. Thanks to efforts by a Keenan alumnus, LaFun also now has Bank of America, Chase, NDFCU and 1St Source ATMs in the basement. If you are a member of one of these banks, you can avoid ATM withdrawal fees. Other fee-charged ATMs are located in the Main Building, South Dining Hall, North Dining Hall, the Bookstore, the Joyce Center and many other places. Chase is a popular bank that is located near Martin’s supermarket, and the city bus (#7, UP Mall-bound) will take you there. Though credit cards are not necessary, they are useful, especially in case of emergencies. If interested, you can apply for one before you arrive. Students tend to get Chase Freedom or Discover It card as their first card. For more information about credit cards and offers, contact your in-dorm expert Paul Kim (paul.kim.296@nd.edu). Most students use cell phones. The free public phone on each floor is primarily for emergencies and limited outgoing calls (local and toll free numbers only). You can also sign up for in-room phone service for a fee. What should I do about laundry? St. Michael’s Laundry provides bundle service for $230/semester OR per item service. Bundle service includes all machine washable clothing submitted in your bundle each week. They will wash, dry, and fold your laundry. 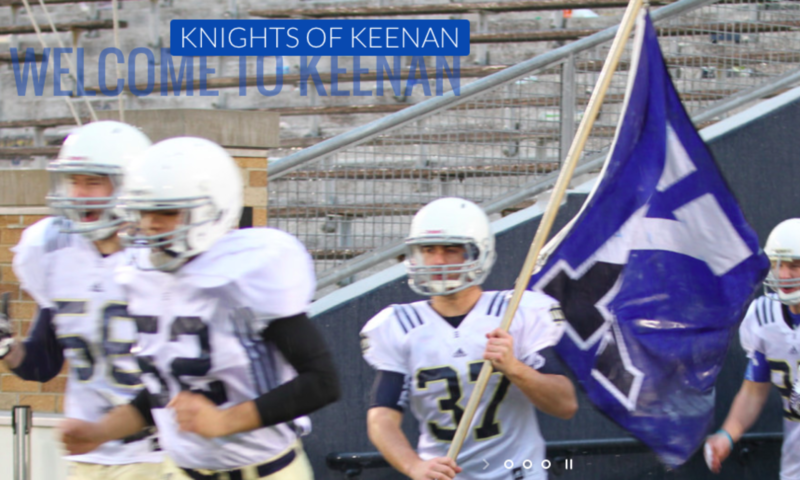 They pick up the laundry from Keenan at 7:00 a.m. on Tuesdays and return it to Keenan by 3:00 p.m. Thursdays. Check out their website for more information. Dry cleaning and tailor services are available at the laundry distribution center. However, if you would prefer to do your own laundry, Keenan is equipped with laundry machines ($1.50/wash and $1.00/dry–less 25¢ if using Domer Dollars). Doing your own laundry could save you a few bucks. If you plan to do your laundry, don’t forget laundry soap, etc. When a couple of aspirin won’t do the trick, you can go to the University Health Center, located just to the west of Keenan. There is a nurse on duty at all times (except during Christmas break) and doctors are available Monday through Friday from 9:00 a.m. until 5:00 p.m. by appointment or walk-in. Check out their website for more information. In emergencies, there is a major hospital in Mishawaka, Indiana. The only thing predictable about weather in South Bend is that it is unpredictable. Though the early fall and late spring can be hot and humid, winter starts early and lasts for a long time. Therefore, it would be in your best interest to pack some warm clothes. That is a good question. In April 2006 Indiana began observing Daylight Savings Time after more than 30 years. Most of Indiana, including South Bend, is located in the eastern time zone. We are the same time as New York, Philadelphia and Boston. Whom should I go to if I have questions? If you want to know about classes, your First Year Studies advisor is probably your best bet. During orientation weekend, you will be told who your advisor is. Upperclassmen are also a great resource for information about classes and general information about Notre Dame. Rectors and resident assistants are also always willing to answer your questions and help you out any time. Bikes are NOT necessary to get around campus. Some students use them. Those on bikes do use the same sidewalks as everyone else so it is not always quicker. If you bring a bike, also bring a good bike lock and a spare key, as bike theft is too common. Notre Dame Security/Police provides free registration for bikes, which is strongly recommended. For the not so brave, bike storage for the winter is available. Although many students bring bikes, most find them more of a nuisance than a convenience. Where do I keep my car? AT HOME! Freshmen are not permitted to have cars. The public mass transit service of St. Joseph County offers FREE service to Notre Dame students on all its routes, just show your student ID. This service includes the “Sweep” bus which runs a circular route from Notre Dame to St. Mary’s College. There is direct service from campus to University Park Mall and to downtown South Bend. You can transfer to other buses along the way. Visit their website www.sbtranspo.com. Can I get a Student Job? Campus jobs are available. Most are able to work around your class and study schedules. You will be receiving more information about jobs in the near future. Please note, that you must provide your social security number and proof of U.S. citizenship. This can be done with the following original documents: 1) U.S. passport; 2) driver’s license and social security card; or 3) driver’s license and certified birth certificate. Non-U.S. citizens must provide the following original documents: passport, I-94 and I-20 forms. For additional information or to see current student employment openings, visit their website: http://studentemployment.nd.edu. That all depends on you. Keenan has several study areas in addition to the desk in your room. Many like to use the second floor study lounge which is usually very quiet with good lighting, a few recliners and many desks–it is also air conditioned. There are also some rooms in the basement which can be used for group study or quiet study. The library is very popular. Many floors have recently been renovated and are quite nice (especially floor 10). There is also study space at the LaFortune Student Center, the Coleman-Morse building, plus all the women’s dorms have study lounges. Be ready for the freshman 15. There is much truth to the saying that freshmen will put on fifteen pounds. It is easy to put on weight. Although it is our right to complain about the food they serve, we eat it and it shows. Keenan has its own weight room which is open 24 hours a day. We ask that you use a spotter, especially since we do not staff the room. But for those of you who prefer the latest in equipment and for those who need the frills of air conditioning, there is Rolfs Sports Recreation Center (Rolfs) with free weights, exercise machines, basketball courts, jogging track, and a floor hockey rink. Other indoor sports areas are Rolfs Aquatic Center–pool; the Joyce Center– basketball/volleyball, jogging, weight and exercise room, badminton and racquetball/handball; Rockne Memorial (The Rock)–pool, basketball, racquetball, weights, climbing; and Eck Tennis Center– tennis. Outdoor opportunities are too numerous to mention but do include golf so bring your clubs if you’ve got ‘em. Check out rec sports web site at recsports.nd.edu. I was a star athlete in high school, but now what do I do? Notre Dame provides many opportunities for club sports, Olympic sports, intra and inter hall competitions–enough to make any jock give up sleep for a year. There is no reason not to keep active at Notre Dame, except studies. The major mall is University Park Mall (UP Mall). The anchor stores are JC Penney, Sears, and Macy’s. The best way to get there is to hitch a ride with an upperclassman. The public bus system, Transpo, does have a route from the Library circle to UP Mall. This mall is at the northern edge of what is called the Grape Road Corridor, with many retailers such as Best Buy, Wal-Mart, Target Super Center, Kohl’s, Lowes, Bed Bath & Beyond, Meijer, Office Max, Office Depot, Circuit City. The public bus system does provide service to most of these stores. The bookstore does sell some toiletries and personal items but the prices can be high. US Mail is delivered to Keenan each morning. Two Keenan students are hired to sort that mail into the mailboxes. Usually they deliver US Mail packages directly to your room. There is one mailbox for each room. Please note, Keenan cannot accept shipments prior to your arrival to campus. The post office is located between the North Dining Hall and Stepan Center. It is a two minute walk from Keenan. What about overnight mail and other packages? Due to the fact that US Mail does not deliver to addresses on campus, Express Mail packages are NOT always delivered the next day. Officially, they make attempts to deliver by placing a notice in Keenan’s post office box. Someone has to go to the post office to pick it up. Thus you are STRONGLY ENCOURAGED to waive the signature (the post office closes at 4:00 p.m. Monday through Fridays and noon on Saturdays.) Parents, let your son know that a package is coming. This is an option only if you waive the signature AND the item will fit in the package locker. Items shipped via UPS, Fed Ex, and DHL are delivered directly to the hall and unless a signature is required, there is seldom a delay in delivery. How do I travel to/from South Bend? Air travel to South Bend is very convenient except when all the students are trying to fly in or out within a few days. If you have difficulty getting a reservation, consider flying in and out of Chicago. Coach USA provides eight buses a day to and from both Midway and O’Hare airports. They also add extra trips at the beginning and end of school vacations. The trip is about 3 hours 20 minutes and the bus leaves from Notre Dame’s main gate. Their toll free number is 1-800- 248-8747 and their website is http://www.coachusa.com/. Prices may change without notice.